If you live in or are visiting a part of the world where winters are cold and snowy, then you know the lyric "Oh, the weather outside is frightful" can be all too true! The unwelcome mix of cold, dehydrating air and the skin-distressing dip in temperature takes a toll, and not only on dry skin; these conditions affect combination and oily skin, too! Regardless of skin type, winter is the season when most of us need to adjust our skincare routines. But, if you have combination to oily skin, you worry (and rightly so) that using richer, emollient moisturisers will make your oily areas even more oily. No more worrying: Stopping winter’s impact doesn’t have to clog pores or make skin feel greasy, not if you know which types of products to use. We’ve got you covered, with just a few simple modifications to your current skincare routine. When the temperature drops and cold winds whistle, that chilly air is dry, and that low humidity can be a disaster for skin! After all, it’s the humidity that helps keep skin smooth and deters dryness and flaking. In addition to the low humidity outdoors, there’s also the assault indoors from dry, heated air. This combination—cold and dry outside and hot and dry inside—is just too much, even for those with oily skin. As a result, your oily or combination skin can begin looking and feeling dry, sensitive, red, dehydrated, and uncomfortable. You can’t control the weather, and turning off the heat indoors isn’t an option. What you can do, and easily, to keep your skin comforted and hydrated is add specialised but weightless hydration-drenching products to trick your skin into thinking Spring is in the air. Regardless of the season, if you have combination to oily skin, you want to avoid products that make skin feel coated and greasy, a mix that can cause clogged pores and bumps. To keep this from happening during winter, forget that typical recommendation to switch to richer cleansers and facial moisturisers—your skin will not be happy if you follow this misguided advice! Managing combination to oily skin during the cold, dry winter months does not mean loading up on heavy-duty products; rather, you need to layer a series of lightweight products that provide smoothing, replenishing ingredients without making skin feel weighed down or oily. At Paula’s Choice Skincare, selecting one or two of our serums and boosters will give you the best results, without compromising your skin. These innovative lightweight formulas are packed with the types of ingredients your skin needs to look and feel smoother, softer, more even, and more radiant all year long. Morning and evening, cleanse with a gentle water-soluble cleanser. Morning and evening, apply your skin-replenishing toner (no need to rinse). Once or twice a day, apply a leave-on BHA exfoliant. Morning and evening, apply Hyaluronic Acid Booster over dry areas, including around the eyes. Morning and evening, apply RESIST Ultra-Light Super Antioxidant Concentrate Serum over dry areas, including around the eyes. For daytime, apply your moisturiser or foundation with sunscreen and at night, apply SKIN BALANCING Invisible Finish Moisture Gel to dry areas, including around the eyes. Unless skin is very oily, avoid the use of absorbent clay masks during cold winter weather. During the day, dab a mattifier over shine-prone areas, either under or over your foundation. If skin is flaky, don’t reach for your facial cleansing brush. Unless the bristles are cashmere-soft, you could end up making matters worse. Remove flaky skin by gently massaging the areas with a warm washcloth, and follow with a replenishing toner. Don’t forget your BHA exfoliant, which helps skin naturally shed the unwanted flaky surface skin. Got clogged pores or bumpy skin? Avoid products that contain drying, sensitising ingredients like denatured alcohol, eucalyptus, menthol, mint, and witch hazel. 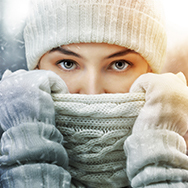 These will conspire to make winter’s visible effects on skin more noticeable than ever.